Think it's impossible to get rid of stink bugs? Think again. Let me take you by the hand and show you the exact same step-by-step method I used to finally eradicate stink bugs from my home. They are the most unwelcome of all household pests I've had the please of experiencing in my life. I have personally had one or two fly into my face, land and stink, while making dinner in the kitchen. For many years we just put up with it -- after all, this is not a year 'round problem -- it only happens a couple months out of the year. 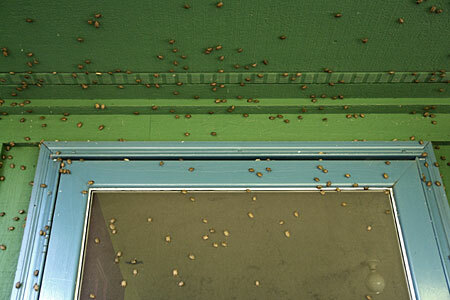 Also, we didn't have one of those stink bug infestations of biblical proportions. 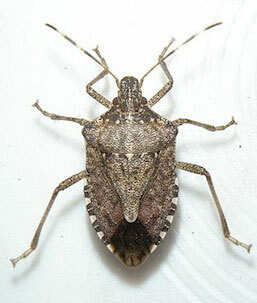 At the worst time of year some people in the eastern United States get literally thousands of stink bugs in their home on a daily basis (see photo below). When my family's tolerance for these stinky little pests finally reached it's breaking point, I set out to wage war against the stink bugs. But getting rid of them wasn't that easy! If you've ever tried I'm sure you'll agree. With kids, dogs, cats, and regular guests, the idea of spreading extermination chemicals around the sinks, counters, ceilings, and bedrooms wasn't a very appealing option. I had to figure out how to do it without pesticides. Used to Get Rid of Stink Bugs Once and For All! And because of the big success I've had with helping thousands of people get rid of silverfish from their homes (see my other site: www.getridofsilverfish.com) I decided to put together a guide on how to get rid of stink bugs too. Full step-by-step advice and checklists to make sure you haven't missed a thing. In an effort to make sure this guide isn't out of anyone's reach, I am offering my solution to you at the introductory price of only $19.95. At this price it is affordable to everyone and much cheaper than what you would pay an exterminator. Also, don't forget to send in your testimonials once you've read and used the book. Unlike other people selling ebooks online, I will not add fake testimonials to my website. I'm very proud of Stink Bug Armageddon and I believe you will be very happy with it. But I'm going to take it one step further... Let me completely remove the risk. If you make the small investment in this stink bug elimination strategy today, you will have a full 60 days to decide if it's right for you! If you're not happy for any reason, you are entitled to a 100% refund of your purchase! When you order your copy of Stink Bug Armageddon you are covered by a 60-day money back guarantee. If for any reason you find that the information in Stink Bug Armageddon isn't suitable for you, simply contact contact us and your money will be refunded in less than one day. I'm willing to take all the risk because I know you will be so happy with the results of this guide that instead of contacting me for a refund, you'll be contacting me to tell me how wonderful you feel now that you no longer have stink bugs in your home! Why wait? If you've had enough of the stinky terrorists occupying your home, click the ADD TO CART button below and instantly download Stink Bug Armageddon. The benefit of that alone is worth a lot more than $19.95! If you're still considering an exterminator as option, their methods cost ten times as much and only provide temporary stink bug control. I am offering a much better result, risk free, at a tiny fraction of the price. So take action now and solve this problem for good! You've got nothing to lose except your stinky little friends. 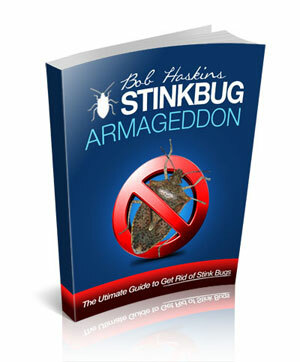 "Effective stink bug control for everyone." P.S. I know from first hand experience how annoying these little stinkers can be. I also know from first hand experience how difficult it can be to get rid of them. Take advantage of this offer today and get rid of stink bugs for good. You will save hundreds of dollars by using my method over the alternative of calling an exterminator and it's guaranteed to work!